It’s a Monday morning and my students are filing into the classroom rambunctiously after our weekly assembly. As they settle onto the rug in the front of the classroom, I already have the projector loaded up with twitter and we are looking at the weekly math problem/picture that gets posted from the weekly math talk (#mtgr1). This week’s image is a picture with children and balloons climbing a hill. My students and I spent 5 minutes discussing the various math problems they could create based on the image. We also scroll through the other hashtags and see what other first graders around the country have come up with. Set up around the classroom, there are tables with various tools, paper, pencils, markers, white boards, iPads and math manipulatives. Students are dismissed and they eagerly seek out the tools they will need to recreate their math problem. Some students spend a great deal of time writing various word problems and drawing pictures. Others open an app such as educreations and illustrate multiple number sentences they see in the math picture. About a third of my students reach for their iPad initially, the rest spent time using other writing tools such as pencils, markers and paper. Eventually, all students will use their iPad in the very least to snap a picture of their work to blog about later while some will complete the whole assignment on their iPad. This example really highlights what 1:1 looks like in first grade. Students are still using pencils, paper, whiteboards, markers and their iPads are just another tool for them to use. We as teachers are still teaching kids math, reading, writing, social studies and science. But because our students have access to iPads they are able to capture and share their learning with others and get immediate feedback. I often stand back and watch students as they work to figure out a problem and I still marvel at how students approach problems differently. What works for one doesn’t for another. So often I will approach students and say, “Wow,I never thought of doing it that way…can I show your work?” And in a second I can project their work on the classroom projector and everyone can now see a “new’ way to approach a problem. Once that happens, the learning is infectious and everyone wants to project their ideas. And before you know it, students are teaching students and all of us are learning from one another. It always surprises me when parents or other adults suggest that our youngest students already get too much screen time and that iPads aren’t appropriate in elementary school. And then I realize that most people don’t understand that it’s not about giving kids a device and picking an app, and sending them off to work in a corner. It’s a tool that provides student with another way to show their learning. Technology gives them so many more choices. Using creation-based apps students can draw, write, and voice their thinking. They can add pictures and graphics. They can upload their work to share on their blogs and they can share their thinking with other first grade students in the classroom and around the world. 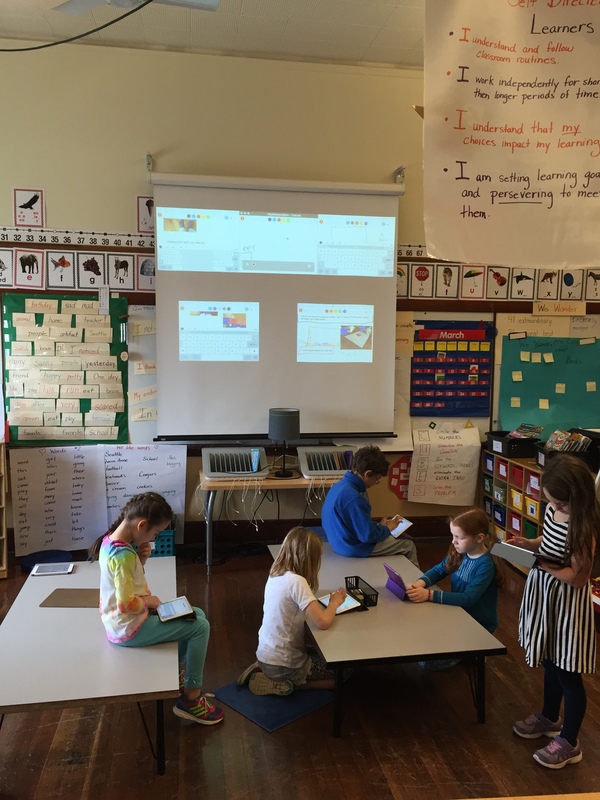 When we started this journey, we knew from the start, that we would not be using a lot of apps in the classroom. And that was hard because there are amazing apps designed to help students practice math facts, learn to read, etc. Instead, we wanted the focus to be on the classroom and what we were already doing. We didn’t want iPads and technology to be “one more thing”, one more subject on an already jam packed schedule. It needed to be interwoven into our reading, writing and math workshops. It needed to be a place where students could share what they were learning and eventually became a portfolio of what they accomplished in first grade. I see something truly special in this site. Thank you for posting. Thank you Shelia! We are hoping to connect with other teachers who feel they too have something to share. Thanks Shelia! We so appreciate the comment!